The Rangers play their 63rd game of the 2016-17 season tonight, Feb. 28, against the Washington Capitals in a Metropolitan Division matchup at Madison Square Garden (7:00 p.m. ET - TV: MSG Network; Radio: ESPN 98.7 FM). The Blueshirts have won nine of their last 12 games (9-2-1), as well as 12 of their last 17 contests (12-4-1). The Rangers have posted a 40-20-2 record this season. 2016-17: Tomorrow's game is the third of four meetings between the Rangers and Capitals, and the second of two meetings between the two teams at MSG. The Rangers have posted a 2-0-0 record (1-0-0 at home; 1-0-0 on the road), and the Blueshirts defeated the Capitals, 2-1, in the last meeting between the two teams on Feb. 19 at MSG. New York has outscored Washington, 6-3, thus far in the season series. Henrik Lundqvist has posted a 2-0-0 record, along with a 1.50 GAA and a .950 SV% (57 saves on 60 shots) in two appearances. Following tomorrow's game, the Rangers and Capitals will face each other on the following date: Apr. 5 (at Washington). The Rangers have earned at least one point in 18 of their last 25 games against Washington, dating back to Dec. 12, 2010 (16-7-2). In addition, the Blueshirts have registered at least one point in nine of their last 12 contests against the Capitals (8-3-1). The Rangers have tallied at least three goals in nine of their last 12 games against Washington. Brady Skjei and Nate Schmidt were teammates at the University of Minnesota for one season (2012-13). Ryan McDonagh and Lars Eller were selected in consecutive picks in the first round of the 2007 NHL Entry Draft (McDonagh - 12th overall by Montreal; Eller - 13th overall by St. Louis). Jim Schoenfeld was Washington's Head Coach for parts of four seasons (1993-94 - 1996-97). Capitals General Manager Brian MacLellan played with the Rangers during the 1985-86 season. Kevin Klein's first head coach in the NHL was Barry Trotz (2005-06 - 2013-14 with Nashville). Henrik Lundqvist - 34 GP, 21-9-4, 2.58 GAA, .909 SV%, 4 SO - In his last 17 appearances against the Capitals (dating back to Dec. 12, 2010), Lundqvist has posted a 12-3-2 record, along with a 2.09 GAA, a .926 SV%, and 3 SO. Rick Nash - 24 GP, 13-12-25 - Nash has tallied 10 points (six goals, four assists) in his last 10 games against Washington. Ryan McDonagh - 24 GP, 2-16-18 - McDonagh enters the contest with a six-game point streak against the Capitals (one goal, seven assists over the span), and he has registered 10 points (one goal, nine assists) in his last nine contests against Washington. Since the start of the 2012-13 season, McDonagh has notched a point in 13 of 18 games against Washington, tallying 16 points (one goal, 15 assists) over the span. Kevin Hayes - 11 GP, 4-5-9 - Hayes has posted four multi-point games in 11 career contests against Washington, including three multi-point games in his last eight contests against the Capitals. Mats Zuccarello - 17 GP, 1-8-9 - Zuccarello has recorded eight points (one goal, seven assists) in the last 11 games against the Capitals. The Rangers' 40 wins in 2016-17 are tied for the fourth-most the team has earned through the first 62 games of one season in franchise history. The Blueshirts have earned at least 40 wins through the first 62 games of a season five times in franchise history (1971-72, 1972-73, 1993-94, 2011-12, 2016-17). The Rangers rank second in the NHL in wins this season. The Rangers earned their 40th win of the 2016-17 season on Feb. 25 at New Jersey. The Blueshirts have registered at least 40 wins in each of the last four seasons (since 2013-14), in six of the last seven seasons (since 2010-11), and in 10 of the last 12 seasons (since 2005-06). Since Dec. 22, 2015, the Rangers have posted a 33-8-1 record in the game following a loss (regulation or overtime/shootout). New York has posted a 16-4-1 record in games following a loss in 2016-17. The Rangers have earned at least one point in six of their last seven home games, dating back to Feb. 5 vs. Calgary (5-1-1 record). Since Jan. 7, 13 of the Rangers' 21 games have been decided by one goal. The Rangers have earned at least one point in each of the last 10 games they have played which were decided by one goal, dating back to Jan. 22 (9-0-1). The Blueshirts have posted an 18-7-2 record in one-goal games this season and are tied for the NHL lead in winning percentage in one-goal games in 2016-17 (.667). New York ranks second in the NHL in goals (206 - includes three team goals awarded for shootout wins) and ranks fifth in the NHL in goals per game (3.27) this season. The Rangers have allowed two goals or fewer in regulation in 11 of the last 17 games and in 37 of 60 games this season. The Blueshirts have posted a 31-4-2 record in those 37 contests in 2016-17. Blueshirts defensemen have tallied 17 points (six goals, 11 assists) over the last eight games and a Rangers defenseman has recorded a goal in five of the eight contests (Klein - Feb. 11 vs. Colorado; Girardi - Feb. 13 at Columbus; Holden - Feb. 16 at NY Islanders; McDonagh - Feb. 19 vs. Washington; Clendening - Feb. 25 at New Jersey). The Blueshirts lead the NHL in third period goals in 2016-17 (84). The Rangers' 84 goals in the third period are the most a team has registered in any period this season. New York has recorded the second-fewest penalty minutes in the NHL this season (424). The Rangers have been shorthanded three times or fewer in each of the last six games and in 17 of the last 19 contests. The Rangers have posted a 29-7-4 record in 40 games in February since the start of the 2014-15 season, including a 9-2-1 record in games in February this season. The Rangers are one win away from tying the franchise record for wins in February in a season (10; previously accomplished in 1971-72, 2014-15, and 2015-16). The Rangers recorded 30 shots on goal in their last game on Feb. 26 vs. Columbus, and 13 of 18 skaters registered at least one shot on goal in the contest. The Blueshirts have registered at least 30 shots on goal in each of the last five games, in 11 of the last 14 contests, and in 16 of the last 21 games. In addition, New York has registered exactly 30 shots on goal in each of its last five home games. The Rangers have posted a 15-12-1 record in games which they have allowed the first goal of the game this season. The Blueshirts are tied for the NHL lead in wins when allowing the first goal of the game in 2016-17 (tied with Pittsburgh, Philadelphia, and Calgary). Henrik Lundqvist earned his 400th career NHL win on Feb. 11 vs. Colorado, becoming the 12th goaltender in NHL history to earn 400 career wins, as well as the first goaltender to earn 400 wins with the Rangers. Lundqvist, who earned his 400th career NHL win in his 727th career NHL appearance, became the fastest goaltender in NHL history to accomplish the feat. He also became the second goaltender in NHL history to earn all of his first 400 career wins with one franchise (Brodeur - NJD). Lundqvist has posted a 10-3-1 record, along with a 2.13 GAA, a .931 SV%, and 1 SO in his last 15 appearances. Brady Skjei has registered 12 points (one goal, 11 assists) and a plus-12 rating in the last 17 games (since Jan. 19), and he is the only NHL player who has recorded at least 12 points and a plus-12 rating over the span. He has also notched nine assists/points in the last 13 games, including eight assists/points in the last 11 games. Skjei has tallied 23 even strength assists this season, becoming the first Rangers defenseman to tally at least 20 even strength assists in his rookie season since Brian Leetch in 1988-89. J.T. Miller has registered a point in 18 of the last 25 games, tallying 25 points (10 goals, 15 assists) over the span, and he has posted two, seven-game point streaks during the stretch. Miller has established career-highs in assists (28), points (47), and game-winning goals (six) in 2016-17. Michael Grabner ranks second in the NHL in even strength goals (25), is tied for eighth in plus/minus rating (plus-28), and is tied for 11th in goals (26) this season. Grabner has skated in 103:51 of ice time while shorthanded this season, and the Rangers have only allowed five power play goals against while he has been on the ice in 2016-17. Kevin Hayes has recorded eight points (two goals, six assists) in 10 games since returning from injury. He leads the NHL in shorthanded assists (five) and shorthanded points (six) this season, and he has also tied his career-high in assists (28). Mats Zuccarello has recorded 24 points (four goals, 20 assists) in the last 29 games, and he has tallied a point in 19 of the 29 contests. Zuccarello, who has registered a shootout goal in two of the Rangers' last four games, is tied for second in the NHL in shootout goals this season (four). Jesper Fast and Oscar Lindberg have registered 11 points (five goals, six assists) over the last 11 games, dating back to Feb. 5. The Rangers were 0-for-2 (4:00) on Feb. 26 vs. Columbus. The Blueshirts are tied for 16th in the NHL in power play efficiency this season (18.9%; 34-for-180). The Rangers were 1-for-2 (2:42) on Feb. 26 vs. Columbus. New York has not allowed a PPG against in 10 of the last 17 games. 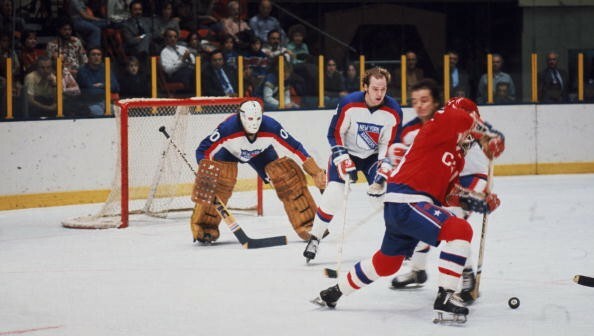 Feb. 27, 1989 - Guy Lafleur registered the final hat trick of his NHL career, tallying three goals as the Rangers defeated the Los Angeles Kings, 6-4, at MSG. Feb. 27, 2012 - Henrik Lundqvist became the first goaltender in NHL history to earn at least 30 wins in each of his first seven NHL seasons as the Rangers defeated the New Jersey Devils, 2-0, at MSG. Feb. 28, 1928 - The Rangers earned a shutout for the fourth consecutive game, defeating the Toronto Maple Leafs, 1-0, at MSG. The Blueshirts' four consecutive shutouts from Feb. 23, 1928 vs. Pittsburgh to Feb. 28, 1928 vs. Toronto remain a franchise record, and Lorne Chabot is the only goaltender in franchise history who has posted four straight shutouts. Feb. 28, 1929 - John Ross Roach registered his 13th shutout of the 1928-29 season. Roach's 13 shutouts in 1928-29 are a single-season franchise record. Feb. 28, 1963 - Gump Worsley earned his 200th career NHL win and became the first goaltender to register 200 career wins with the Rangers in franchise history as the Blueshirts defeated the Chicago Black Hawks, 6-1, in Chicago. Feb. 28, 1976 - Dave Maloney registered his first career NHL goal. Feb. 28, 1988 - The Rangers signed Mike Richter to his first NHL contract. Feb. 28, 1994 - Mike Richter earned his 100th career NHL win, stopping 26 of 27 shots he faced as the Rangers defeated the Philadelphia Flyers, 4-1, at MSG. Feb. 28, 2001 - Brian Leetch registered his 200th career NHL goal, becoming the first defenseman to tally 200 career goals with the Rangers in franchise history, and the Rangers defeated the Florida Panthers, 4-2, at MSG. Feb. 28, 2002 - Brian Leetch skated in his 1,000th career NHL game, becoming the third player to skate in at least 1,000 games with the Rangers in franchise history (along with Harry Howell and Rod Gilbert). Location: Katz Deli....I wish I'm thinking the pic is from the 1976-77 season. JD, Farrish, and I believe that's Gilbert (from the face). Great pic as always Steady!! Buchnevich sent down to Hartford. This is most likely an on-paper move. Maybe a little of both actually, he's the one getting squeezed based on injuries. He may play down there, per Gorton. Don't disagree with it but he's waiver exempt which is one big reason why he's the one being sent down. shattenkirk drills ovie in the head first PP. Location: Katz Deli....I wish Kreider went off....didn't look promising. Groin issue? Location: AV is gone Have the Rangers even had the puck this period? Location: NYC & Charlotte, NC Typical Ranger second period. Have the Rangers even had the puck this period? Chicken and potatoes. It was good too. Location: NYC & Charlotte, NC Caps just controlling every facet of the game... Rangers can't complete two passes without being swamped by two Caps. I love a good fried chicken. Mashed potatoes? Or baked?